Dream Chaser Racin’s Janette Thornley was able to cinch the 2015 Pro Fuel Championship at the NHRA Harley Davidson Drag Racing Series season finale in Las Vegas. The Statesville, NC resident entered the event trailing points leader Dennis Fisher by 5 points, but the championship was decided in the first round of eliminations, when Thornley advanced and Fisher was eliminated. 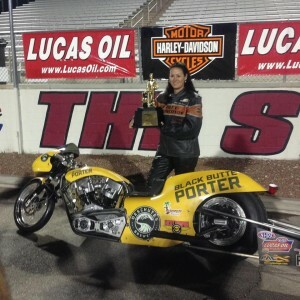 Janette Thornley made history as the first woman to win a national Harley Davidson class championship. She finished with 623 points after losing in the final round to former World Champion, Johnny Vickers at the Las Vegas final race. Thornley won 4 national events: Joliet, Sonoma, Seattle and Bristol leading to her winning of the 2015 NHRA Harley Davidson Pro Fuel championship title. Thornley has not yet announced 2016 racing plans.